It’s the first time I’ve been able to coordinate the launch of non-password protected blogs to a school and I’ve been thrilled with the first couple of weeks and how the teachers and students have reacted and interacted on them. 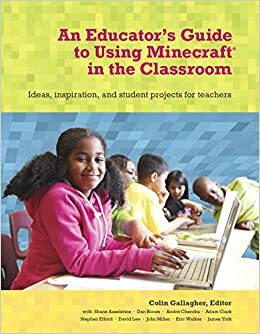 When faced with the teachers wanting to do a blog across the grade I was a little skeptical and not entirely sure of how it would turn out. But I wanted blogs up and running so it was a start and a push in the right direction. To be honest there are a number of things I actually prefer in a grade level blog over a class blog! There is more opportunity for student and teacher interaction, there is more of an audience and there is more chance of regular updates from the teachers and students. It works, in our school, as we only have 3 classes per grade level so it doesn’t get too busy and chaotic. 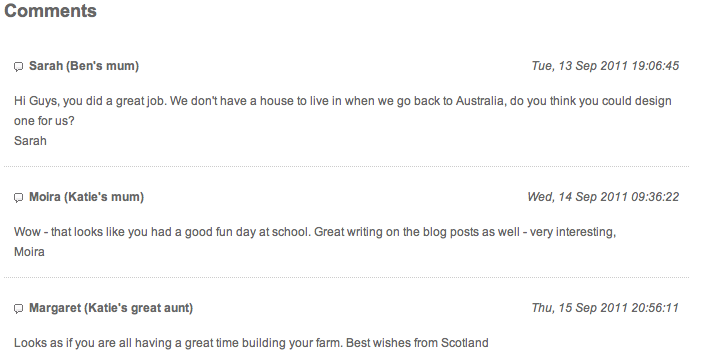 Let’s take a look at some happenings on our blogs so far. A Grade 3 student decided to do a PowerPoint for homework on Healthy Choices in our Who We Are unit. 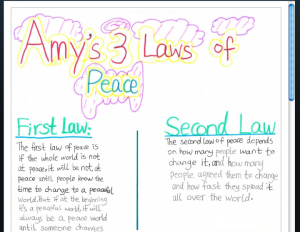 An example of some self directed learning from a student was now available to a wider audience after been posted to the blog. 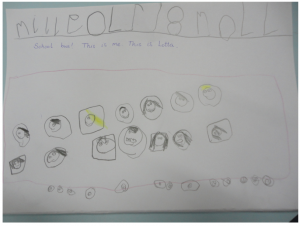 Two layers of student work with these Grade 3 students writing their own post and also showing their experiment in pictures. 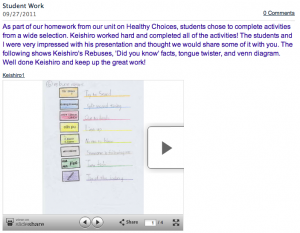 There is so much work to show the families of K1 students a blog is a great platform to do it. K1 teachers take a lot of photos during their normal school day so putting them up for the world to see on their blog is not too much of a stretch to do. 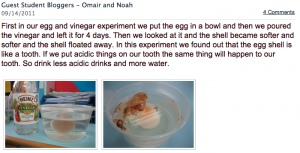 One of the greatest things I’ve seen with our new blogs is the interaction between classroom and home. New channels of communication are opened up and families are invited into their child’s learning. Even the grandparents back home can feel closer to their grandchildren. I must have a chat with Shunya about CAPS LOCK! As I mentioned in a previous post there was some discussion about why our blogs are open to the world. I’m happy with the way our students are conducting themselves and that we can be there to guide them if they veer off the precarious path of appropriate online behavior. I always say it’s best for students to make mistakes with us than away from the learning environment without us.